Join Sound-Healer and Sound-Bath facilitator Viola Rose for a sweet, gentle yet powerful journey with healing sounds and music. Featuring immersion into the sounds and vibrations of multiple gongs for clearing and balancing, heart-opening handpans, native american Flute and drum, chimes, crystal and Tibetan singing bowls and sweet inspired vocals, lulling you into deep relaxation. Viola also shares pure therapeutic grade essential oils for you to enjoy before and after the soundbath. Viola will play her sound healing instruments both in front of you and will also walk around the room playing them over you, so even though it is a group session, it will also feel somewhat like a personalized individual sound healing session as well. Viola holds a clear, clean, strong and loving container for you to relax, let go and release whatever may be holding you back. Transformation, deep relaxation, pain relief, downloads, insights and infusions of Joy are common at her events. Sound-baths can bring you back into harmony physically, mentally, emotionally and spiritually so that you can be your best self. $20-$30 sliding scale. Cash only please. Please bring a COMFORTABLE mat, pillow, eye mask, blanket and whatever you might need to to lie down on the floor, or bring a comfy chair to sit in. the event is 7-8:30pm. Please arrive 5-10 minutes early to set up your “nest”. We begin at 7:30pm. Since listening is a key to this experience it is essential to have a quiet container for our journey together. Please do not attend if you have a cough or persistent sniffles. Also for this reason, this event would not be a good fit for children under 12. WHY Sound Healing/Sound Bath Meditation? Sound healing brings one into a deeply relaxed, meditative state.. an often dream-like ethereal trance state in which stress and anxiety melt away from all levels of your being. Harmony, health & higher states of consciousness flow in, allowing healing, deep peace and well-being to occur on the physical, emotional and spiritual levels. Physically, sound healing works through the nervous system of your body, traveling through the liquid of your cells, and increasing the output of dopamine and serotonin. it is a simple yet profound way to practice self-care. 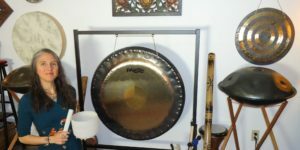 Large high quality gongs have such a huge range of tones, overtones and harmonics, that when played well, they literally bathe every cell of the recipient in sound, and help to bring the person back into a state of harmony and wellbeing. They also work on the subtle energy body, clearing blockages and old stagnant energy, so that the recipient can move forward freely. Most people “come back” from their gongbath journey feeling refreshed, de-stressed and rejuvenated. Some physical aches and pains may have disappeared. Emotions are calmer, and people generally feel more in control of things, and often have been “given” solutions to problems that have been worrying them. People usually feel tingly and as though the gong sound is still working on them, which of course it is – the effect is generally ongoing for several days or even weeks. The gong sounds clear away any energetic debris from the subtle energy body and leave people feeling clear, light and re-energized. Re-tuned, as their whole system has been powerfully vibrated and brought back into a state of harmony​. Viola Rose is a “Transformational Sound Artist” and has been combining Music and Healing as Sound-Healing in her own inspired way for over 25 years. A Multi-Instrumentalist and inspired Vocalist, she enjoys playing Handpan, Gong, Native Flute, Shamanic drum, Sansula, Didgeridoo, and more, with her favorite instrument being her voice. Viola has an extensive background in Spirituality and Metaphysics as well. She is a Heart-based meditation workshop teacher certified with the School of Remembering, and is also a Sound-Healer, Gong Practitioner, Energy Worker, Certified Holistic Health Coach, certified Laughter Yoga teacher and advocate for living from the Heart. Viola has a deep love for the profound ability of Sacred Sound to heal the Heart and balance the Body/Mind/Spirit. Viola is committed to using music to create more beauty in the world and living with Joy. Visit Viola’s website for more info and to book individual and small group Sound sessions, Gong-Baths, music for events, or Handpan lessons. This course is from 11:15an to 4:15pm. 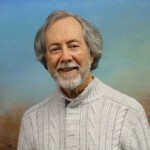 This course takes the student into the realm of the use of the Usui sacred healing symbols. The student will learn to draw, activate, spell and pronounce the names of each of three Usui symbols. The symbols energies will be activated in the students energy field with Holy Fire II Reiki. Students will practice the use of the symbols in giving sessions. Licensed Massage Therapists receive 7 continuing education units for attendance. All students receive certification as a Holy Fire II Usui Reilki Level 2 practitioner. If attended both days of class the student will receive certification as both level 1 & 2 practitioner from the International Center for Reiki Training. One day of class $200 includes manual. Two days of class $375 includes manual.